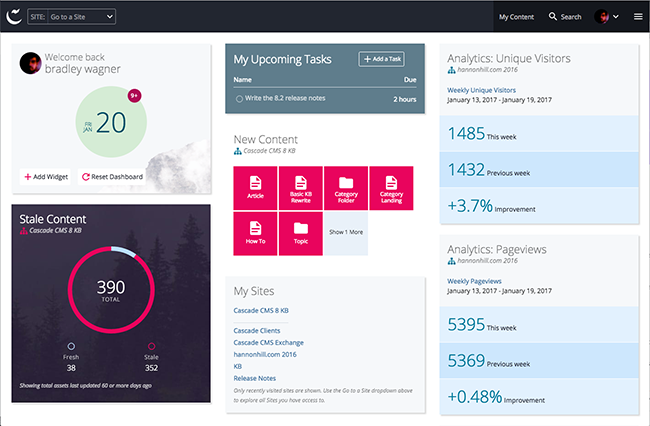 Learn about the CMS Dashboard. The dashboard is pre-loaded with widgets. Many of these provide a way to quickly return to a page or site you were recently working on. The functionality of these widgets will vary depending on your permissions. Go to your settings to connect a specific CMS site to your dashboard widgets. You can drag and drop the widgets to rearrange them. Click on the X in the upper right corner of a widget to delete it. If you want to recover a widget that you deleted, click Reset Dashboard.